Summary: Dean Wampler from Lightbend presented at the Direct Supply MSOE offices on Tuesday, 4/5/2016. 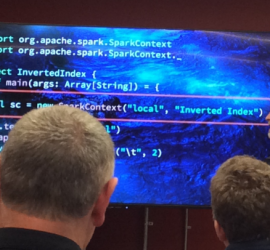 Dean covered a high-level overview of Spark and its benefits (business logic is focus of code and it’s faster). Those wanting to learn more should pick up Learning Spark at O’Reilly books.